A garden cart improves any garden, and I’m especially enjoying using my cart, now in its third decade of use. This cart has hauled hay, manure, weeds, and old vegetable plants to the compost bins, and finished compost from the bins to vegetable beds and fruit trees. It’s hauled stones for wall building and heavy locust posts that get notched and bolted together to become arbors and trellises. A good cart has two heavy duty, bicycle-sized tires sitting just about midway across a sturdy plywood bed surrounded by three sturdy plywood walls. Tossed rocks, the scraping of a shovel, and an occasional jab with the pitchfork have eaten away that plywood over the years. Not anymore, and that’s why I’m especially enjoying using the cart. A few months ago, I decided to replace the plywood bed, which by then had few plies left. Instead of replaying the scenario from the last replacement, about 15 years ago with exterior grade plywood, I used pressure-treated plywood, which is more rot-resistant. And next, to fend off the constant scraping of shovels, rocks, and other tools and materials, I laid 1/4 inch mesh “hardware cloth” over the plywood base and screwed it down. 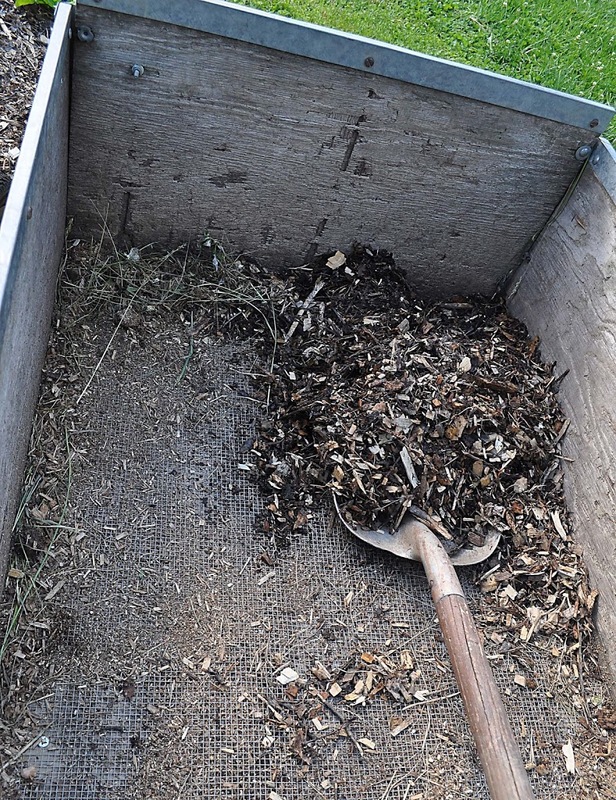 Today, shoveling wood chip mulch out of the cart to spread around the base of newly planted mulberry trees, no little voice in the back of my mind was reminding me that each shovelful was also scraping off a bit of plywood. I’m expecting to get good mileage with the new bed. Stay tuned; I’ll report back in 30 years. Dame’s rocket (Hesperis matronalis), a wildflower often mistakenly thought to be phlox (which has 5 petals instead of the 4 of dame’s rocket, has put on a great show of white, lilac, and pale purple blossoms this year. Now a dark cloud has passed over those cheery flowers. Dame’s rocket, a European native that used to be cultivated in American gardens, escaped from our gardens many years ago to invade road sides, meadows, and cultivated fields. In some places, this comely flower is billed as “invasive.” “Left unchecked, this beautiful, yet lethal plant will wreak havoc on the natural environment, threatening the survival of native plants and degrading habitat and water quality,” writes restoration ecologist Steve Apfelbaum. Call me irresponsible, but I still like dame’s rocket. I welcome it into my flower beds and into my meadow. In addition to beauty, the flower perfumes the air with a delicious, sweet aroma. I have been too blasé about some other invasive plants in the past. I remember praising garlic mustard for its flavor. What was I thinking? The plant is now all over the place and doesn’t even really taste very good. Garlic mustard gets ripped out of the ground wherever I see it, in and around my garden at least. Perhaps I’ll eventually feel the same about autumn olive, which I enjoy for its fragrant blossoms in spring, its silvery leaves in summer, and the oodles of tasty, small red berries it bears in autumn. Thus far, I find Japanese stilt grass, yet another invader, attractive. Sweet, pretty dame’s rocket is allegedly going to contribute to the alleged $200 billion of damage for which invasive plants are responsible. It’s even suggested that the plant might have some resistance to the herbicide Roundup. The whole invasive plant threat has, in my opinion, been blown way out of proportion. Our landscapes, wild and cultivated, are not — and should not — be static. Over time, extant species might become more or less prevalent and new species might move in. And just what does “native” mean? A few hundred feet from the alluvial soil of my garden in the Walkill River valley, the ground slopes up sharply to the craggy, rocky outcroppings of the Shawangunk Ridge. Plants native up there, such as mountain laurel, aren’t native down here. Furthermore, research has shown that non-native species sometimes have a positive environmental impact (see, for example, Mark Davis et al in Nature 474, 153–154, 2011). What a great year for roses, even if I’ve always contended that I didn’t like the roses. Actually, I didn’t and don’t like the roses that are most commonly grown, which are hybrid tea roses. The plants are gawky, something you’d plant out of sight just for cut blossoms, and the flowers are stiff, formal, and jarring in color. They’re also very susceptible to all sorts of pests. I do like the roses I have growing and which are presently drenched with blossoms. The super-hardy William Baffin rose, from Canada is sporting single, large, bright red flowers. Amber Sunblaze is notable for salmon-pink blossoms on a plant whose foliage stays glossy, green, and healthy all summer long. A couple of David Austin rose blossoms look like cupfuls of pastel-colored crêpe paper. 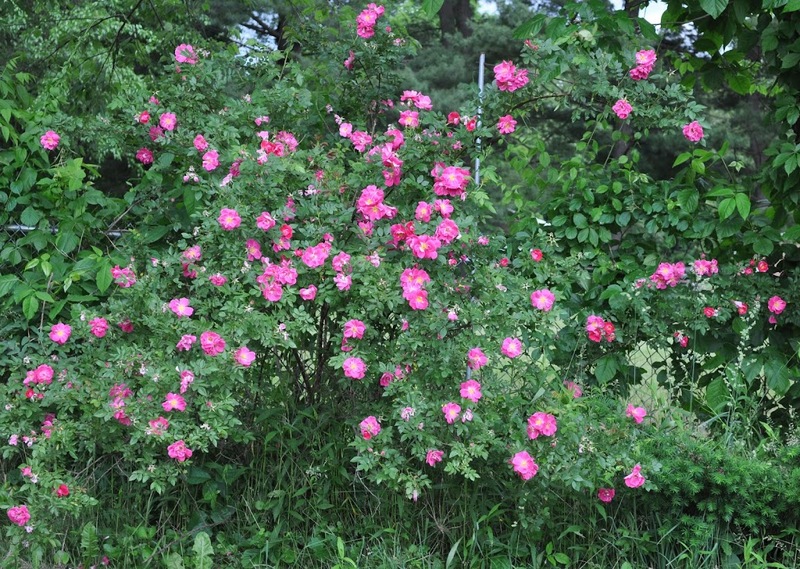 My favorite of all the roses, one given to me as a cutting many years ago by herbalist Ann Solomon, is Rose de Rescht. At least that’s what it’s alleged to be. 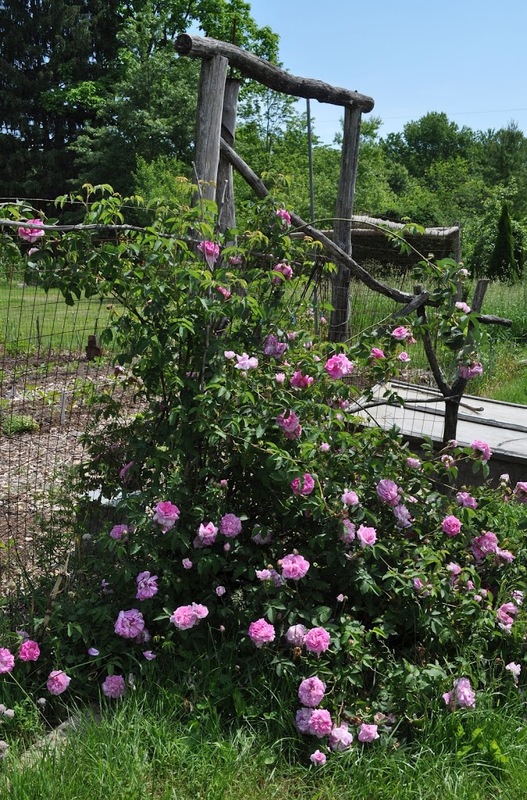 Rose de Rescht is supposed to have more than one bloom period each season, though, and mine has never rebloomed. Then again, mine never flowered as well as it has this year, a couple of years since I moved it to its new and more congenial surroundings. Whether or not my Rose de Rescht really is Rose de Rescht, it’s now covered with blowsy, soft pink blossoms that send their fragrance a few feet from the bush. Everyone that smells the blossoms says something to the effect “Now that is a real rose smell.” And the rose blossomed just in time this year to provide abundant flowers for a very special wedding. This entry was posted in Uncategorized and tagged dame's rocket, garden cart, Hespeeris matronalis, invasive plants, Rose de Rescht, roses. Bookmark the permalink. Trackbacks are closed, but you can post a comment. I find your position on the invasive threat to be a breath of sanity on the subject, so thanks for that. As much as I love native plants, and conservation efforts to promote their use, the zealotry associated with some of the more vocal advocates is a major turn off. Cheers.